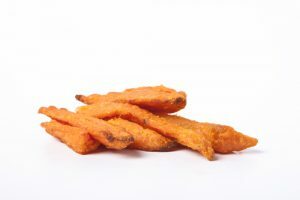 Sweet potatoes provide a great source of beta carotene-a powerful antioxidant! For variation: use russet potatoes instead of sweet potatoes. Place sweet potatoes in a large bowl; add cold water to cover. Let stand for 15 minutes. Preheat oven to 425 degrees F. Spray a non-stick baking sheet with vegetable cooking spray. Set aside. Transfer potatoes to a clean larger bowl. Sprinkle with oil, pepper, paprika and salt; toss gently to combine. Arrange seasoned potatoes in a single layer on prepared baking sheet.